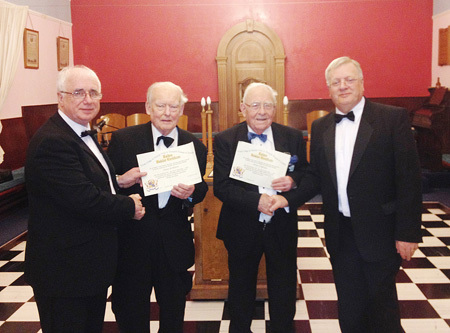 Omagh Masonic; Three brethren receive 50-year jewels. 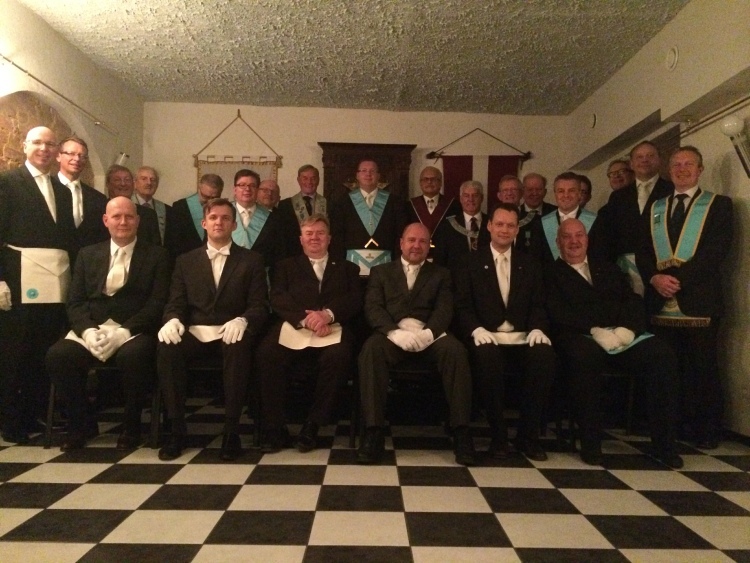 RWBro. 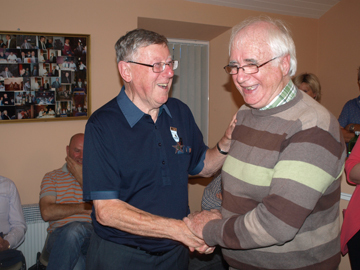 Maurice Lee visits Bro James Warnock, Victory Lodge 459, Coagh. 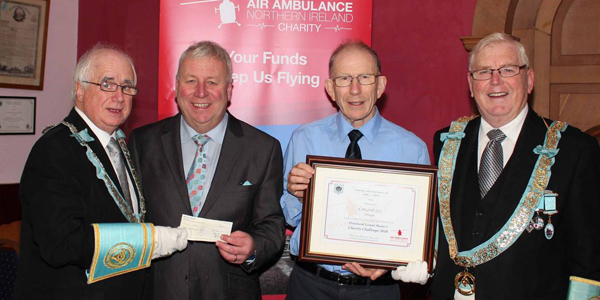 Masons Support Air Ambulance Northern Ireland. 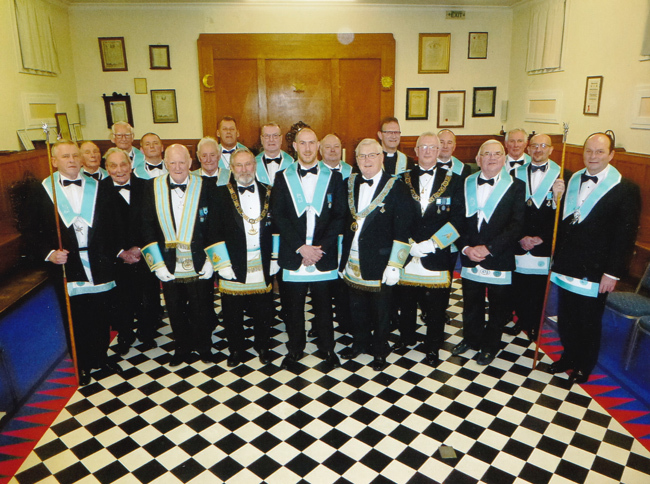 Lodge 586 Worshipful Master Chartity BBQ 2018. 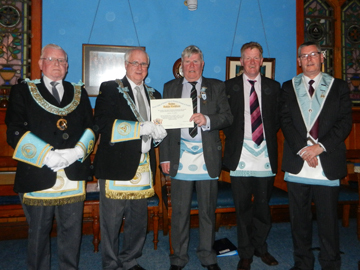 St Andrews 944, Moy, 90th Anniversary. 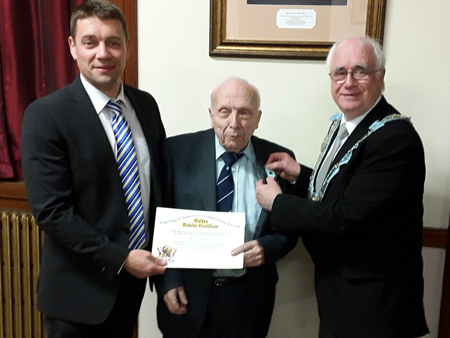 Presentation of 50 Year Jewel to WBro. Cecil Stevenson. 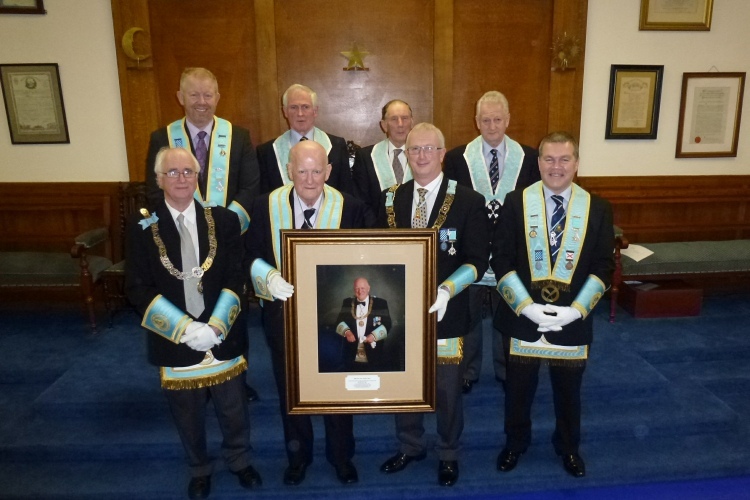 RWBro. 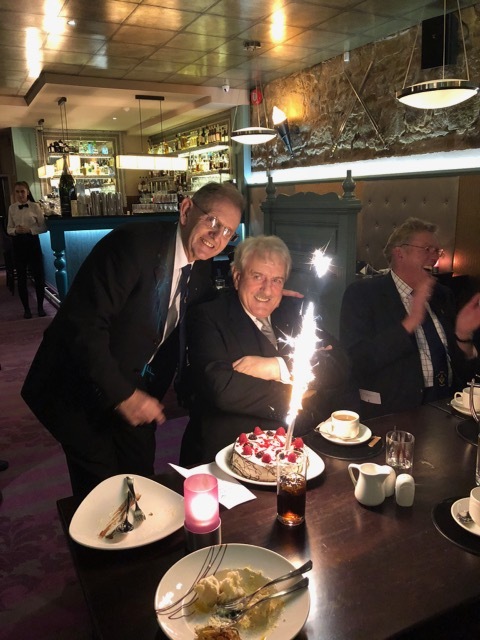 Frank Arnold PDGM celebrates his birthday. 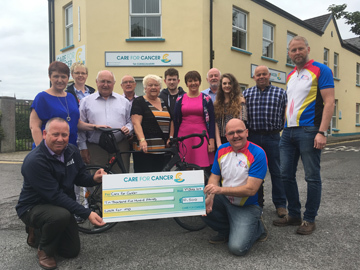 Pomeroy 836 Charity Golf Competition for "Care for Cancer"
"Casualty" comes to Newtownstewart 547!! 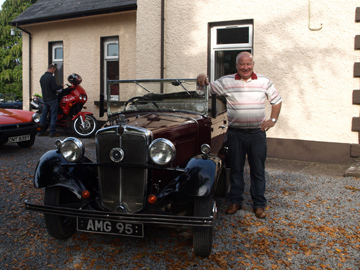 HARMONY BBQ and "Night at the Races"
Gortin ML 994 hosts Widows Sons Masonic Bikers Association. 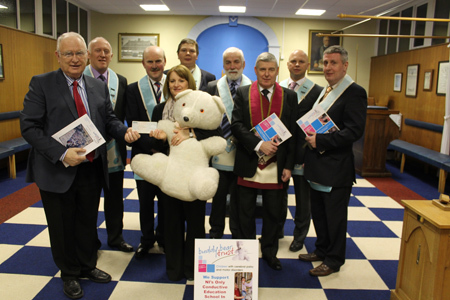 Newtownstewart ML 547 Worshipful Master's Charities. 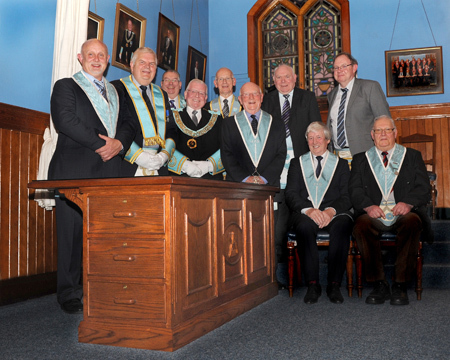 Beautiful New Desk for Cookstown Masonic Hall. 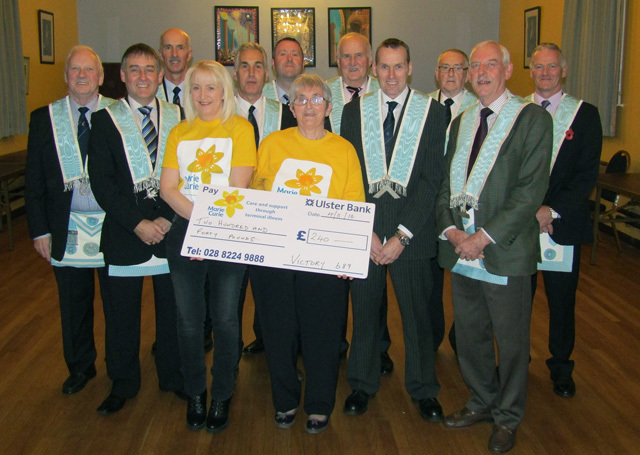 Presentation of Cheque to Somerton House, NI Hospice. 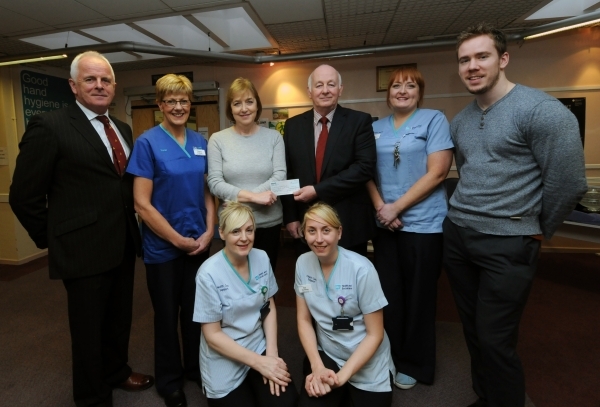 Newtownstewart RAC 547 raise funds for Palliative Care at Tyrone County Hospital and Nepal's "Sherpa Future Fund". 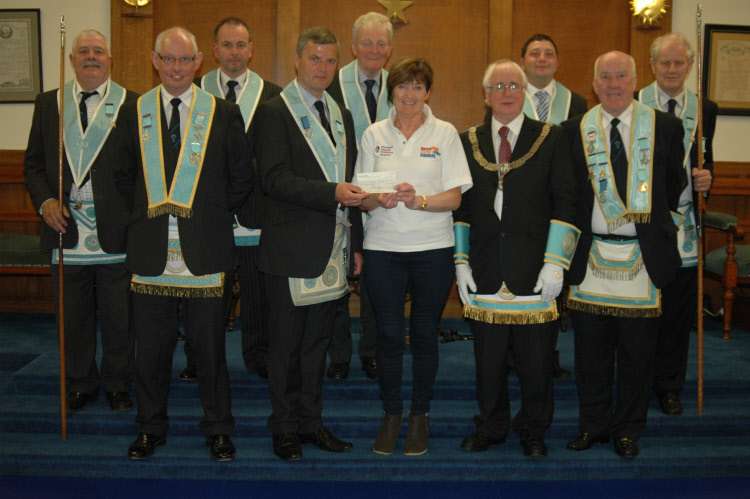 Presentation to Horizon West by Newtownstewart ML 547. 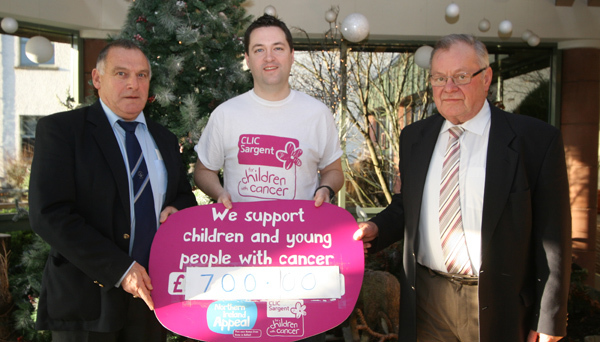 A golf tournament organised by Newtownstewart ML 547 in aid of the Children's Hospice in Killadeas raised the magnificent sum of £2,500.00. 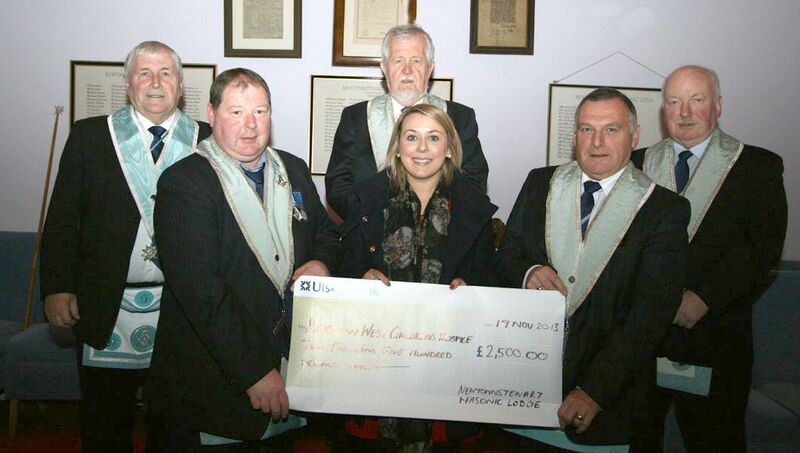 Receiving the cheque from W Bro Sam Gallager [left] and Bro Robert Canders [right] is Gemma McCallan, Horizon West Community Fund Raising Officer....for more. 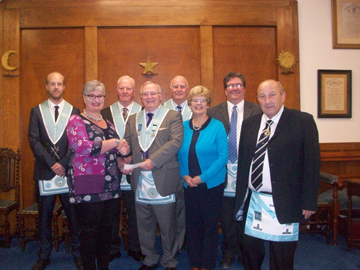 Lodge 689 raise funds for Crohn's and Colitis UK. 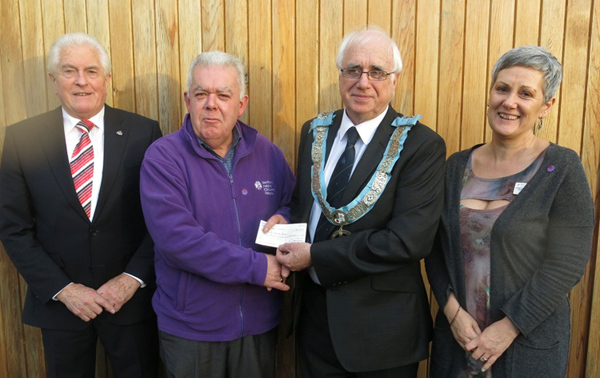 Victory Masonic Lodge 689, Omagh, presenting a cheque for £689 to Mr Craig Elliott who received the cheque on behalf of Crohn's and Colitis UK. 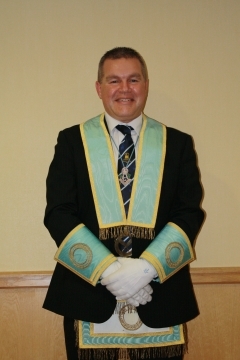 Craig is the son of the current Worshipful Master, W.Bro. 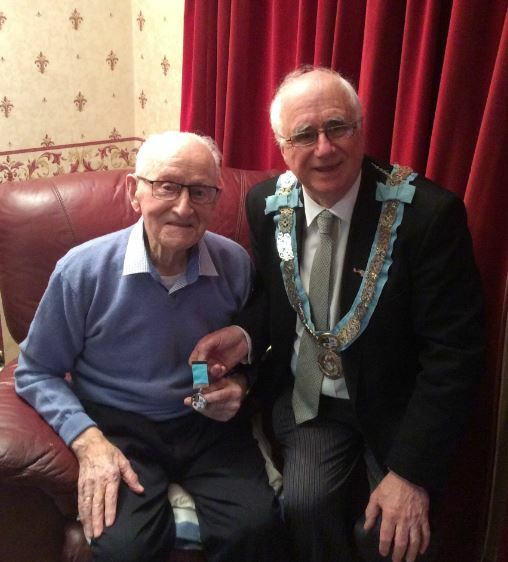 Derek Elliott....for more. 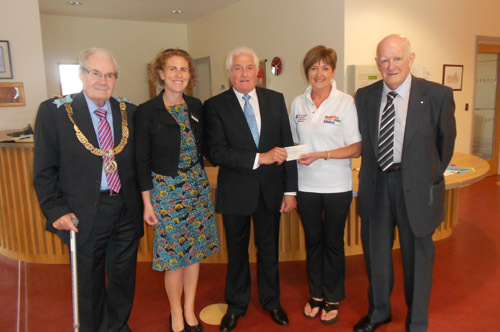 On Thursday 4th July 2013 a cheque for £7.000.00 was presented to the Children's Hospice Killadeas on behalf of the Provincial Grand Lodge of Tyrone & Fermanagh by V.W.Bro E.Hazlett Moore, Provincial Grand Treasurer. 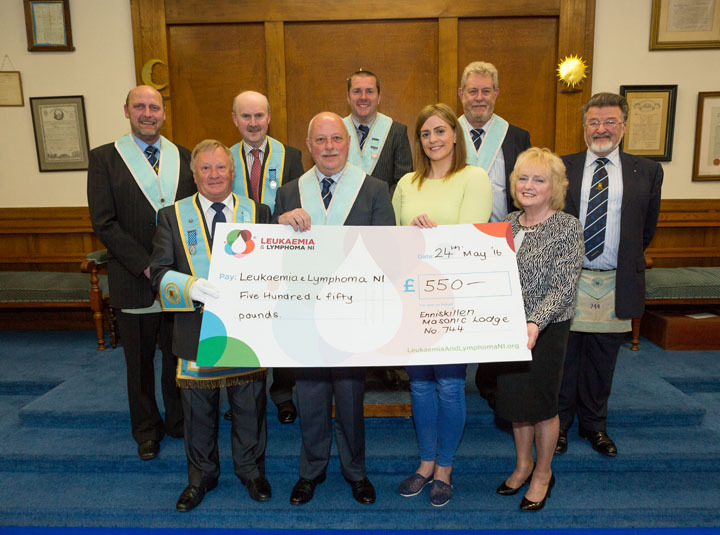 Contributions totalling £6.303.9O from the Lodges was topped up by Provincial Grand Lodge making a sum of £7.000.00:....for more. 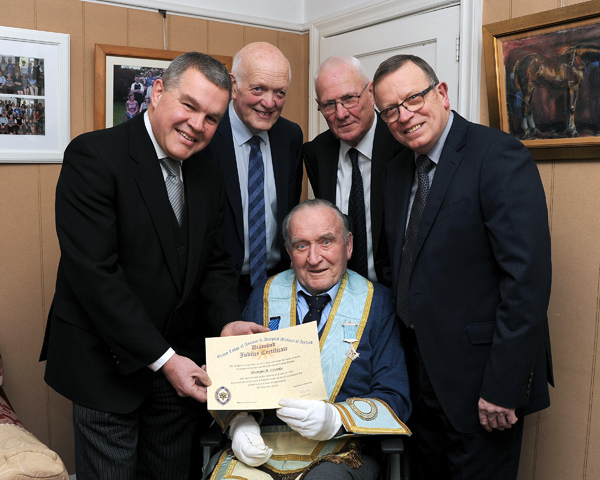 At the April communication of Phoenix Masonic Lodge No.836, R.W.Bro William McLain was presented with a Certificate along with a Bar to his 50 Year Jewel for 60 years membership of the Order by the M.W.Grand Master, M.W.Bro George Dunlop. 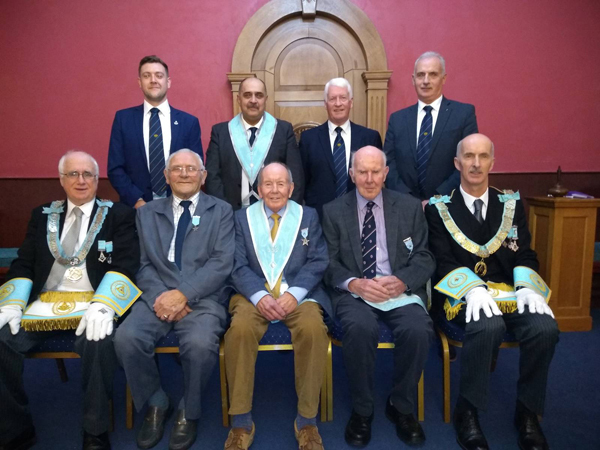 The members of Phoenix Masonic Lodge No.836 were joined by a large contingent of members from Scott Masonic Lodge Coalisland where R.W.Bro McLain is also a member....for more. 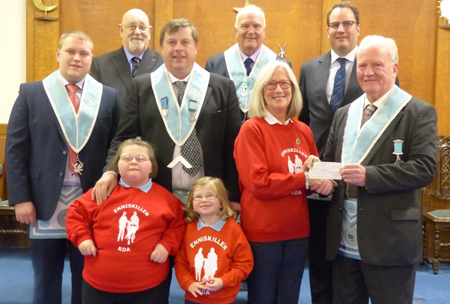 Lodge 823 raise funds for Knockavoe Special School. 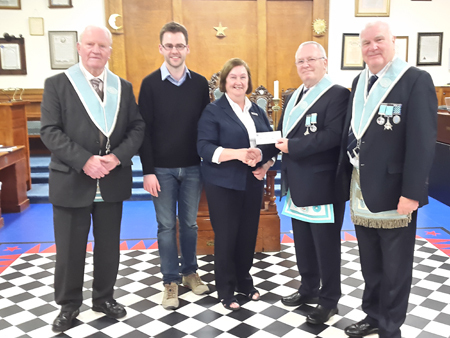 Thanks to the generously of the members and quests of Mourne Masonic Lodge No 823, Strabane, a cheque for £546 was presented by V.W. 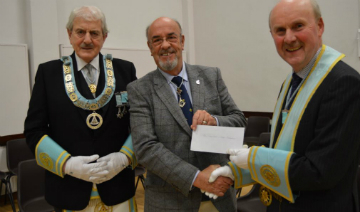 Bro Hill Robinson to Nick Tomlinson V.P. 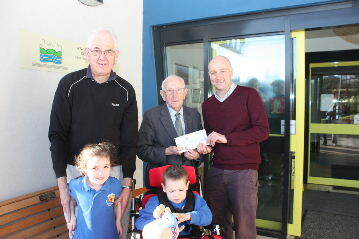 for the friends of Knockavoe special school.....for more. 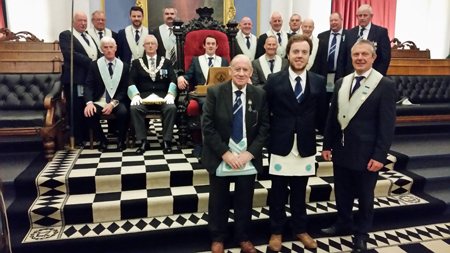 New Masonic Hall Opened and Dedicated at Pomeroy, County Tyrone. 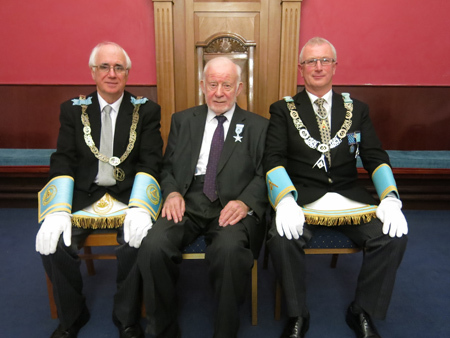 On Saturday 22nd September 2012 at 3:00pm the Brethren of Phoenix Masonic Lodge No. 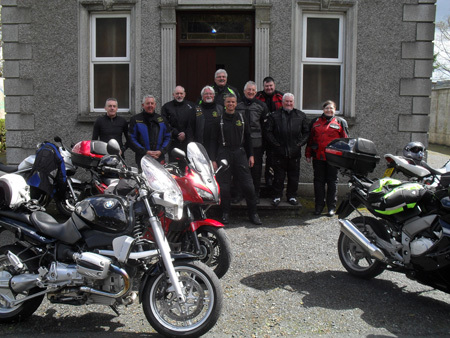 836 Pomeroy along with the Officers of the Provincial Grand Lodge of Tyrone and Fermanagh together with the Grand Master of Ireland Most Worshipful Brother George Dunlop and the Provincial Grand Master of Tyrone and Fermanagh Right Worshipful Brother D. Henry Weir gathered at the Bonn Masonic Hall Pomeroy.........for more. 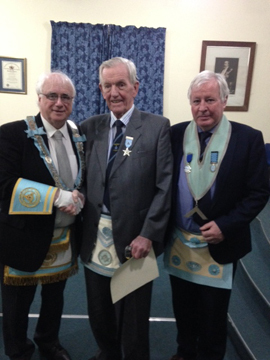 At the last communcation of St Andrew's 944, Moy, before the summer break RW.Bro Harry Weir presented W.Bro Robert Johnston McFarlane with a 50 Year Jewel and the WM W.Bro Kenneth Coalter presented him with his certificate.........for more. 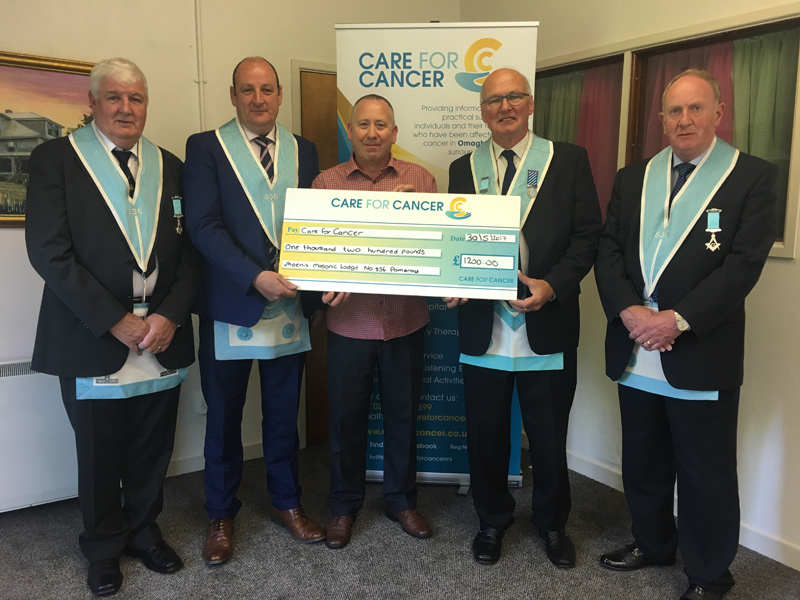 After the Provincial Grand Lodge Communication on the 26th September in Dungannon a cheque for £1410 was presented to the Provincial Grandmaster and the Provincial Grand Treasurer by W.Bros David Jackson, Lodge 315 and Frank McKee, Lodge 277 on behalf of the two lodges. 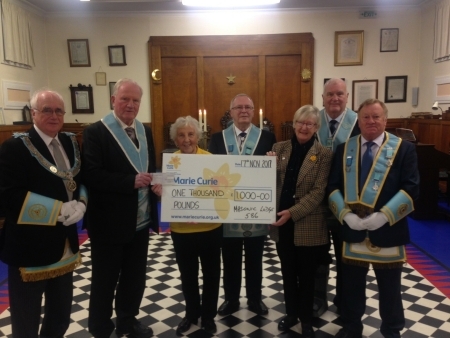 This being the proceeds from their BBQ and will now be forwarded on by Provincial Grand Lodge to the Horizon West Children's Hospice, Killadeas.......for more. 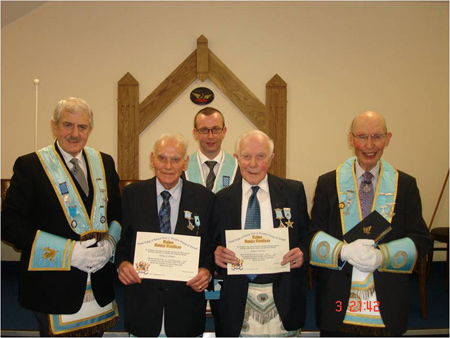 At the last communcation of Irvinestown 277 before the summer break RW.Bro Harry Weir presented VW.Bro Henry Keys with a 50 Year Jewel and the WM W.Bro Nigel Nicholl presented him with his certificate.......for more. 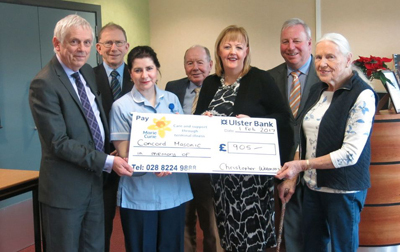 A charity golf competition organised by Newtownstewart ML 547 in aid of Horizon West Children's Hospice raised £1900. 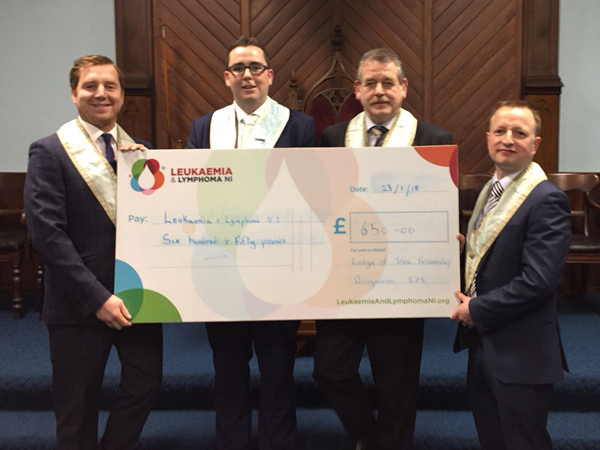 To this was added a donation of £600 from lodge 547 bringing the total to £2500, a sum gratefully acknowledged by the "Friends of Horizon West", two of whose members had helped in promoting the event......for more. 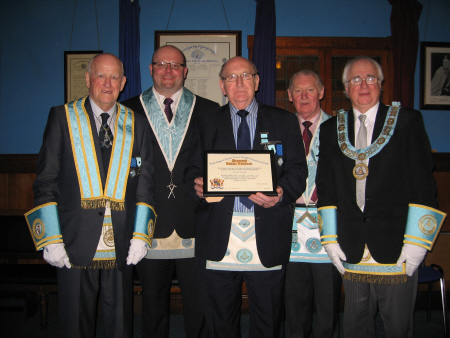 Presented a Certificate and a 70 year Bar to W.Bro. 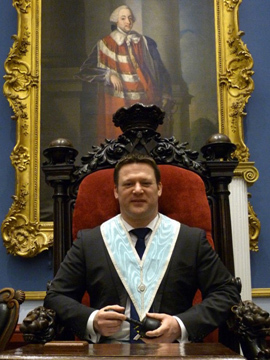 R.T. McKinley, W.Bro. 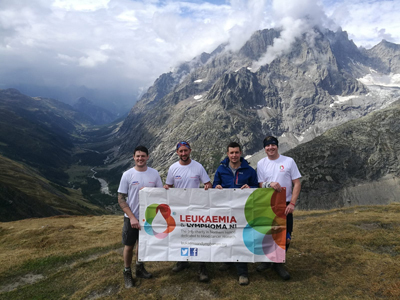 L.W.C. 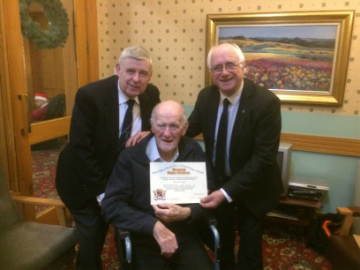 McFarlane was also presented with a certificate and a 60 year Bar. 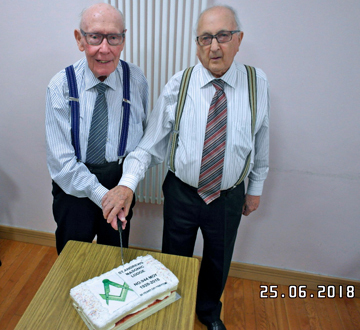 Both Brethren were congratulate for achieving this milestone. 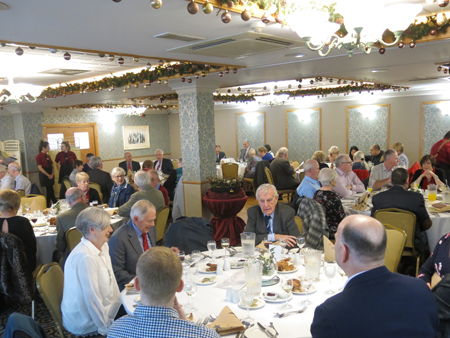 At the close of the meeting all Brethren retired to the dinning room and celebrated the occasion with a fresh salmon supper kindly provided by W.Bro. 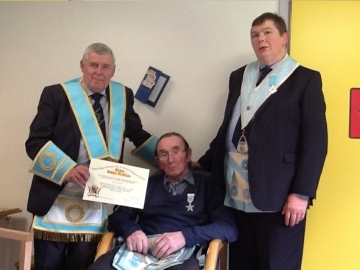 D. Campbell and his son W.Bro. D.R. Campbell......for more. 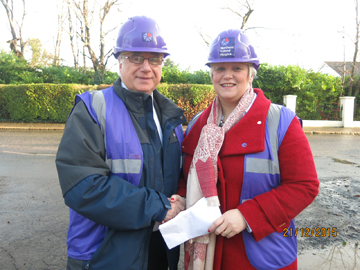 Horizon West, is the new children's hospice in Killadeas, Co. Fermanagh. 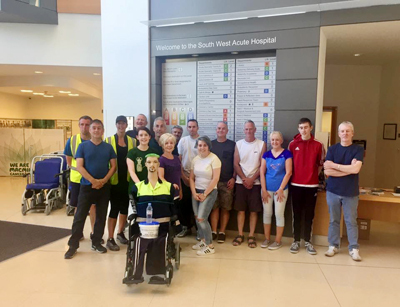 In the last three years fundraising and charitable donations have raised over £1 million pounds - enough to complete the construction of the new building. 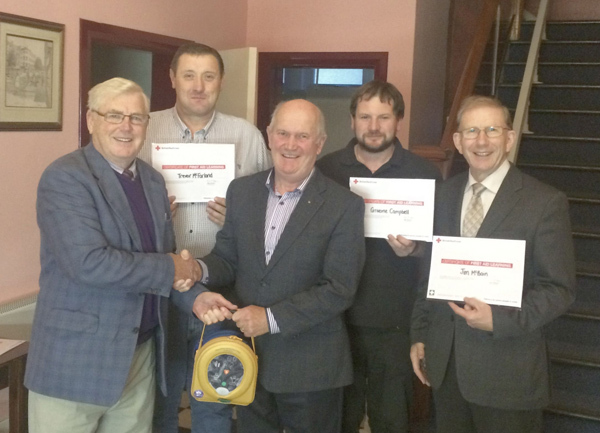 The focus is now on securing donations to get services up and running......for more. 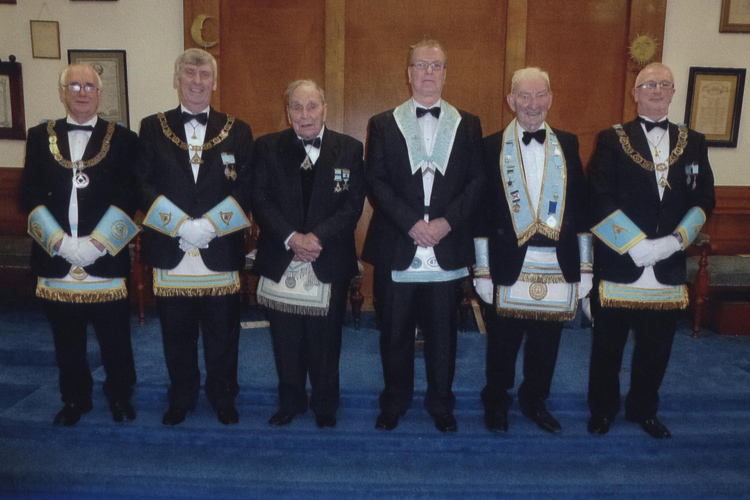 On the 14th October 2011 the brethren of Phoenix Masonic Lodge No. 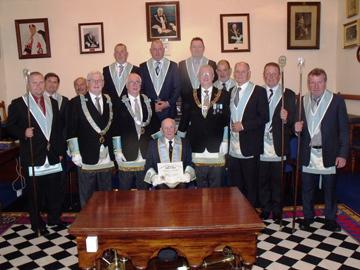 836, Pomeroy, held a formal dress special communication of the Lodge in the Masonic Hall, Campsie Road, Omagh, to celebrate the 90th Anniversary of ther Lodge......for more. 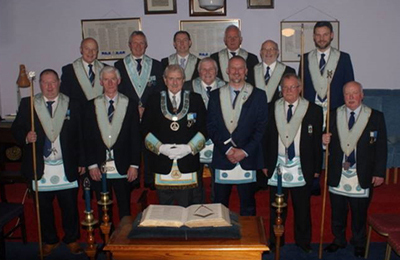 In 2010 Newtownstewart ML 547 "twinned" with St Ninian's Lodge in Newton Stewart in Scotland and on the 18th November 2011 made their second fraternal visit to the their Scottish brethren, accompanied by one brother from Gortin ML 994......for more. 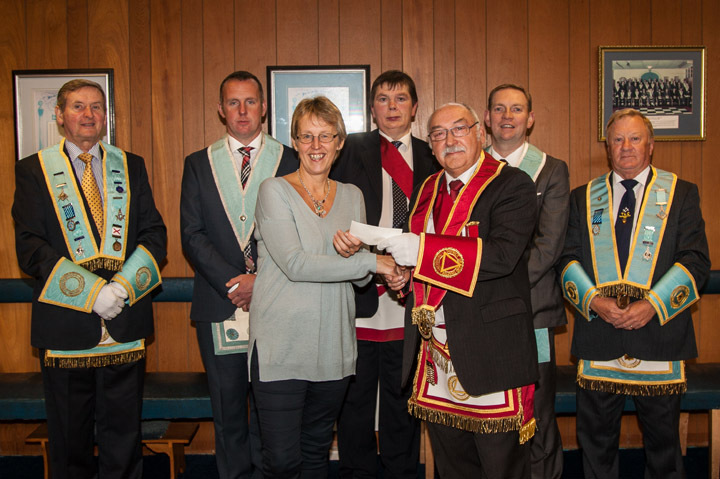 Presenting the cheque for £750.00 the proceeds of a Lodge B.Q. 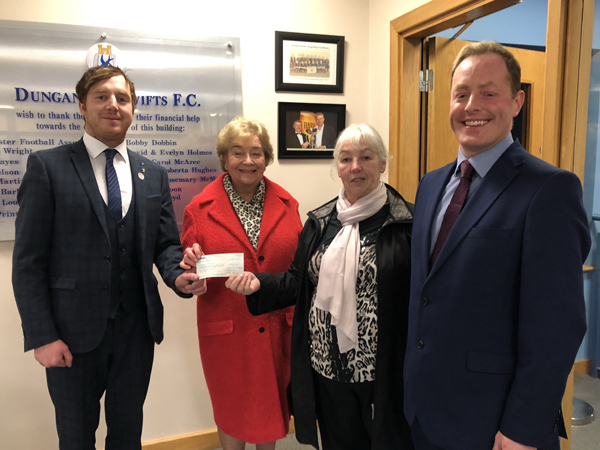 to Mrs Gladys O’Callaghan Chairperson of the Fermanagh Friends of the Children’s Hospice.....for more. 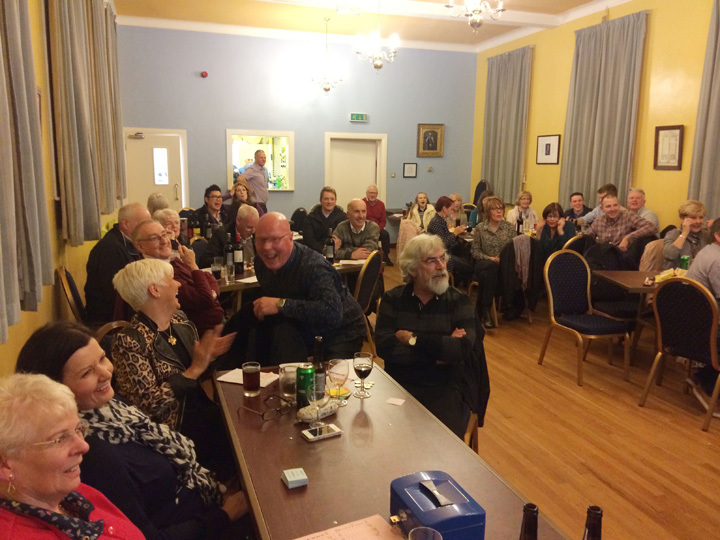 At the Stated Quarterly Communication held in Newtownstewart on Wednesday 28 September 2011, the following announcements were made:....for more. 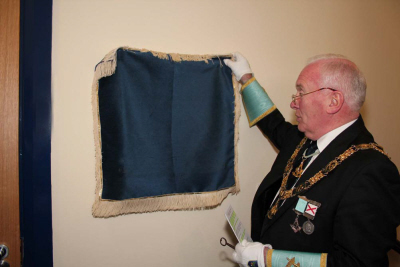 This memorial stone occupies a prominent and eye-catching position in Cookstown Cemetery and also makes specific reference to being erected by Members of Cookstown Masonic Lodge No. 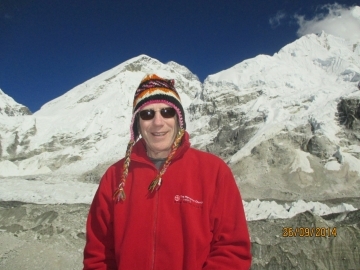 470. 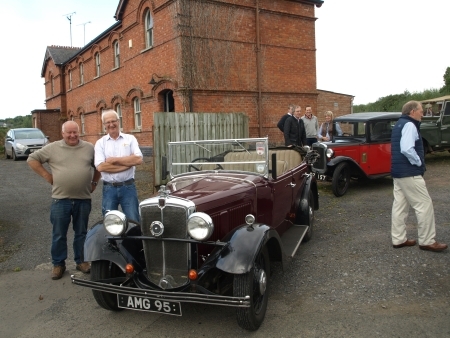 However, the years have taken their toil and the stone and surround were looking rather "tired". 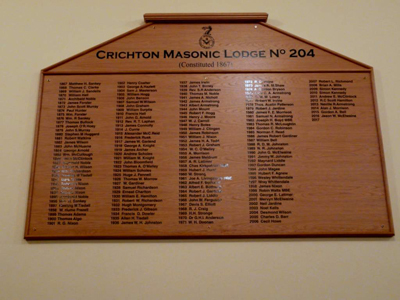 This was noted and consequently raised at a Lodge meeting....for more. W.Bro. 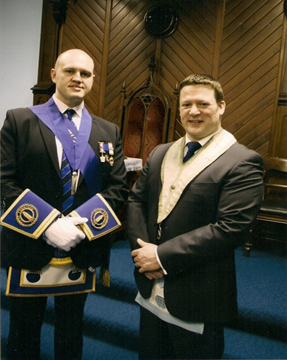 Rufus McFarland Worshipful Master of Gortin 994 welcomes R.W.Bro. 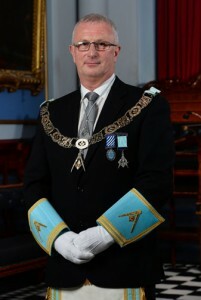 George Lutton, W.Bro. 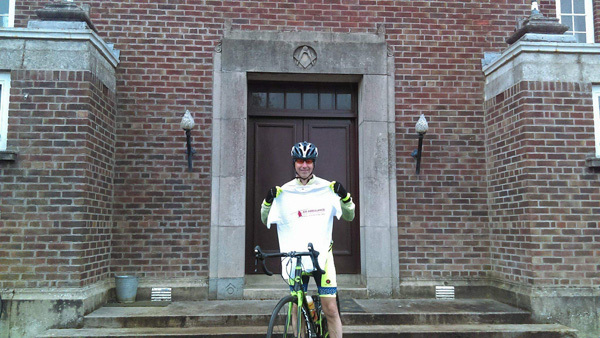 Sam McFarland and W.Bro. 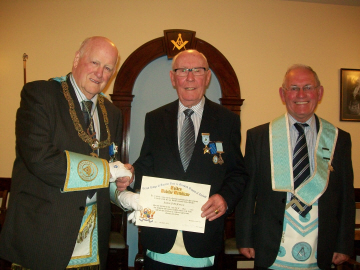 Alan Campbell of Ardmore Lodge 835 Saintfield to the April Communication of Gortin....for more. 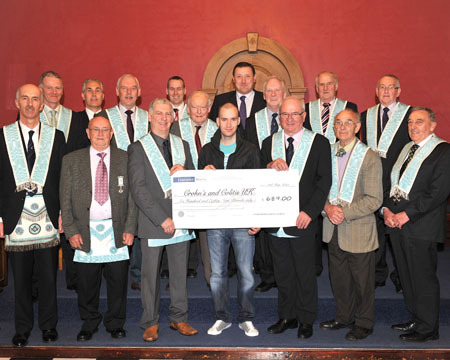 A service of ‘Nine Lessons & Carols’ was held in Brackaville Parish Church, Coalisland on Sunday 12th December 2010 to celebrate the Centenary of Scott Masonic Lodge No.300 Coalisland. 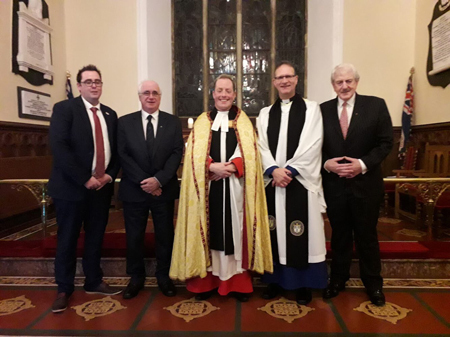 Very Rev Kenneth R.J.Hall Dean of Clogher led the service assisted by the Rev G.M.S.Watson, both former Rectors of Brackaville parish....for more. 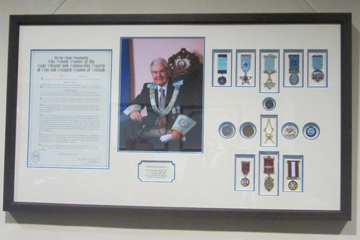 The R.W. 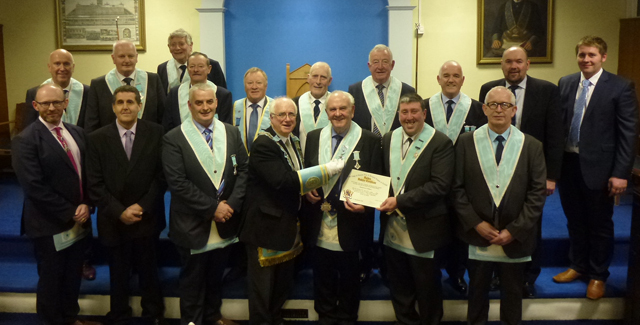 Provincial Grand Lodge of Tyrone and Fermanagh held their September Stated Quarterly Communication in the Derryvullan North Parish Hall, Irvinestown, as part of the Centenary celebrations of the Irvinestown Masonic Lodge 277. 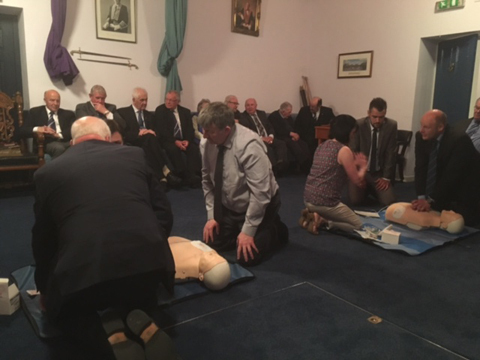 A board of general purposes being held in the Masonic Hall Irvinestown before the communication....for more. 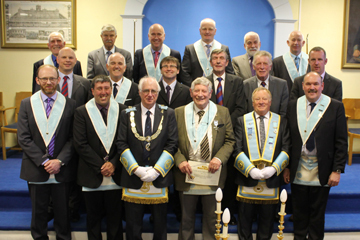 On Friday 25 September 2009 Barton ML No 220 Pettigo dedicated a new Masonic Hall in the presence of the Assistant Grand Master and invited guests from all over the Province of Tyrone and Fermanagh and further afield....for more.